Sheila Dikshit (born March 31, 1938) is the Chief Minister of Delhi since 1998. She is from the Indian National Congress. Smt. Sheila Dikshit was sworn-in as the Chief Minister for a second consecutive term of the Government of the state of Delhi on December 15, 2003. She is the second woman Chief Minister of Delhi. She represents New Delhi Constituency in the Legislative Assembly. 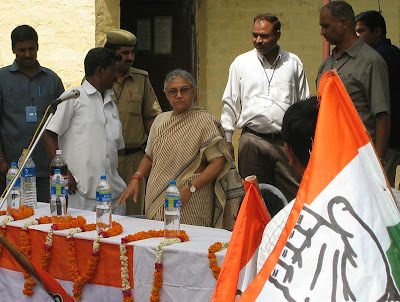 As of Dec 8, 2008, Sheila Dixit and her Congress Party have been elected to serve an unprecedented third consecutive term as Chief Minister of Delhi. She was re-elected as the Chief Minister of Delhi on December 8, 2008. Smt. Sheila Dikshit was born on March 31, 1938. 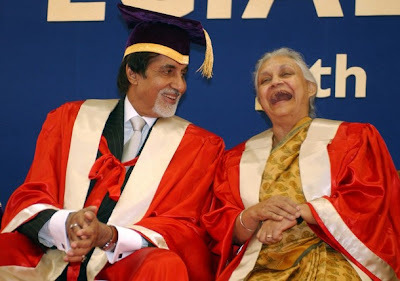 Holder of Master of Arts degree, she received her education at Convent of Jesus and Mary School, New Delhi and later in Miranda House, Delhi University. She was married into the family of Shri Umashankar Dikshit, noted freedom fighter and a former Governor and Union Cabinet Minister. Her late husband Shri Vinod Dikshit was a widely respected member of the Indian Administrative Service.She has two children, son Sandeep Dikshit who is a member of parliament and daughter Latika Dikshit Syed. During the period between 1984 and 1989, she represented Kannauj Parliamentary Constituency of Uttar Pradesh. As a member of Parliament, she served on the Estimates Committee of Lok Sabha. Dikshit also chaired the Implementation Committee for Commemoration of Forty Years of India's Independence and Jawaharlal Nehru centenary. She represented India at United Nations Commission on Status of Women for five years (1984-1989). Smt.Sheila Dikshit brings to the administration vast experience in Administrative and Parliamentary matters. She served as a Minister in the Union Government during 1986 - 89, first as the Minister of State for Parliamentary Affairs and later as a Minister of State in the Prime Minister's office. During 1984 - 89 she represented Kannauj Parliamentary Constituency of Uttar Pradesh. As a member of Parliament, she served on the Estimates Committee of Lok Sabha. She also Chaired the Implementation Committee for Commemoration of Forty Years of India's Independence and Jawaharlal Nehru centenary. As President of the Delhi Pradesh Congress Committee, she led her party to a sweeping victory in the Assembly elections in 1998. She has also served as a Union Minister during 1986-1989, first as the Minister of State for Parliamentary Affairs and later as a Minister of State in the Prime Minister's Office. She is longlisted for the 2008 World Mayor award. As Chief Minister of Delhi Sheila Dikshit was awarded the Best Chief Minister of India, by Journalist Association of India on 12th of July, 2008 by H.K.Sethi Secrtrary General of Organisation. Smt. Sheila Dikshit has championed the cause of women at various fora and in various capacities. She has also been a leading figure in the movement for granting of equal rights to women. She represented India on the U.N. Commission on Status of Women for five years (1984 - 89). In Uttar Pradesh, she along with her 82 colleagues were jailed in August 1990 for 23 days by the state government when she led a movement against the atrocities being committed on women. Electrified by this, lakhs of citizens all over UP joined the movement and coured arrest. Earlier, in the early 1970s, she was chairperson of the Young Women's Association and was instrumental in the setting up two of most successful hostels for working women in Delhi. She is also the Secretary of the Indira Gandhi Memorial Trust. The trust has come to play a leading role in promotion of international understanding. It presents the Indira Gandhi Award for Peace, Disarmament and Development and Organises conferences on issues of the global concern. Under her aegis an Environmental Center has been setup at the trust. (i) Administrative Reforms (ii) General Administration Department (iii) Home Department (iv) Law & Justice and Legislative Affairs (v) Public Relations (vi) Services Department (vii) Vigilance Department (viii) Water (ix) Higher Education (x) Training & Technical Education (xi) Art & Culture (xiii) Environment, Forest & Wild Life Department (xiv) All other Departments not allocated elsewhere.